I had a consultation with a small business owner this morning. 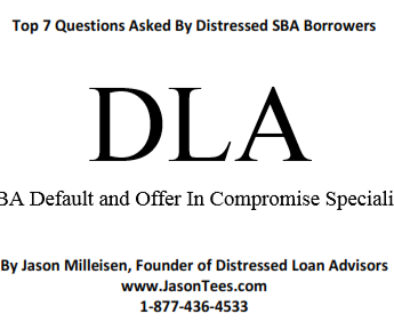 He wanted to know if there was a way to have the bank and SBA lower his loan balance, while keeping the business open. The short is answer? It’s possible, but I’ve not seen it happen recently. The business owner was dumbfounded. “You mean to tell me that they’d rather write off $4 Million when my business closes than take a settlement?” he asked. Unfortunately, based on my experience, the answer to that question is yes, unless you are able to clear some major hurdles. But why do they operate this way? Over years, I’ve developed a theory. It’s not based on anything in the SBA SOP, but rather my personal view on why the SBA is typically unwilling to settle with businesses that remain open and operating. I believe that the reason that the SBA normally requires a business to cease operations is that they don’t want to open the floodgates. If every business with an SBA loan knew that they could possibly settle while remaining open, there would be a massive influx of OICs. Based on existing volume, it already takes 2 months to get a decision on an OIC. Imagine if the volume of OIC proposals was 5-10 times the existing volume. You might not get a decision for a year! Beyond wait time, I also think that the sheet amount of debt forgiveness would be staggering. 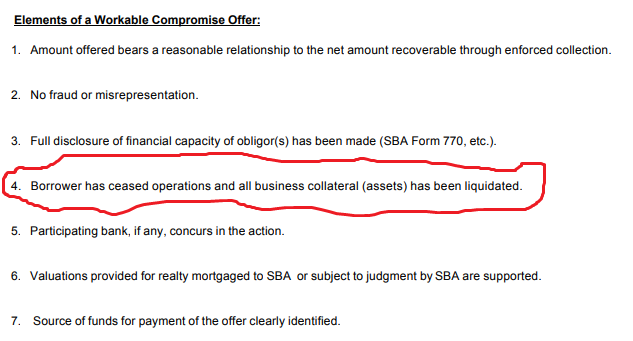 The SBA used to boast that it’s guarantee program was self-funding. This means that even after accounting for defaulted loans, the program covered all it’s expenses with needing financial assistance. If the were to start forgiving loans for businesses that were still open, it’s hard to imagine that could continue to be the case. The final reason I see for taking this “no settlements unless you are closed” stance is that they don’t want to set a precedent for future borrowers. In other words, they wouldn’t want small businesses being attracted to take an SBA loan because they believed they might not have to pay it back. But Jason, the SBA SOP specifically says they CAN forgive debt even if the business is open! I was so pessimistic about our prospects of settling with a going concern that I even noted that it was an unusual circumstance. In the email to the bank and SBA, we even noted that my clients WOULD close the business if necessary, if the settlement terms were approved. That OIC was met with a swift decline. While we were rejected, I did manage to pull out one little tidbit out of the decline email (show below). 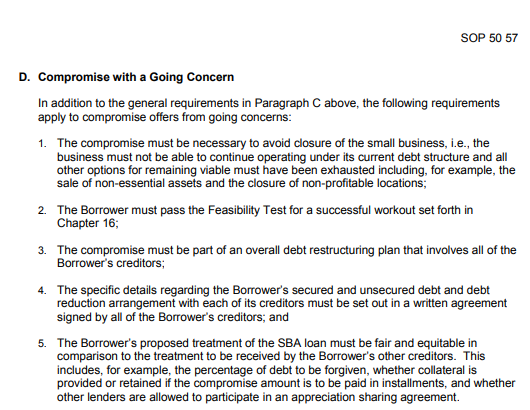 If the SBA is going to consider settling with a business that is open, they want it structured like a bankruptcy. To be clear, when they ask for it to be treated like a bankruptcy, they mean a chapter 11 which calls for a reorganization. This means they want written proof that you’ve worked out settlements with ALL your other creditors. And beyond that, they also want those settlements to be in proportion with the amounts owed. In other words, if you are offering the SBA 10% of what’s owed to them, all your other creditors better be getting only 10% of what’s owed to them. In my experience, accomplishing this outside of an actual BK can be a tall task. And the more creditors you have, the taller the task. 3 to 5 creditors? Doable. 10 creditors? Less Doable. Assuming you can get all your creditors in line, you also need to pass the “feasibility test”. Unfortunately, the requirements are a bit vague. So while the SOP allows for settling a going concern, the Form 1150 appears to take a different stance. 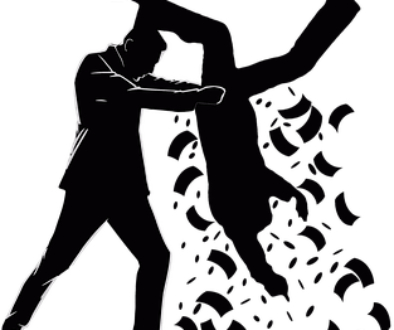 Right on the SBA Form 1150, they state that a business must cease operations. I’ve circled it in red below. It must be nice to be the government, right? I’ve been handling SBA Offer In Compromise since 2008. In that time, I would venture to guess that over 99% of settlements I’ve seen were for businesses that had ceased operations. As I sit here, I can’t even recall a case I’ve worked on that provided for a settlement when a business continued to operate. This doesn’t mean it can’t happen, but it’s definitely out of the norm.